Ford reckons the latest upgrades to the Ecosport are enough to make it feel like an all-new car and a credible rival to the Seat Arona, Renault Captur and Nissan Juke. The latest Ford Ecosport is a big improvement over the car it replaces, thanks to upgraded interior quality, safety equipment and technology. However, it’s still not the most practical car of its type and not the best to drive, either, because it’s neither as comfortable or as quiet as many rivals. Bear in mind the Ecosport competes in a very average class of cars, and that’s a little disappointing. Sweet engine and enough luxury kit. The diesel is cleanest, according to the official figures. Most buyers will upgrade to a pricier trim for more goodies. Interested in buying a Ford EcoSport? 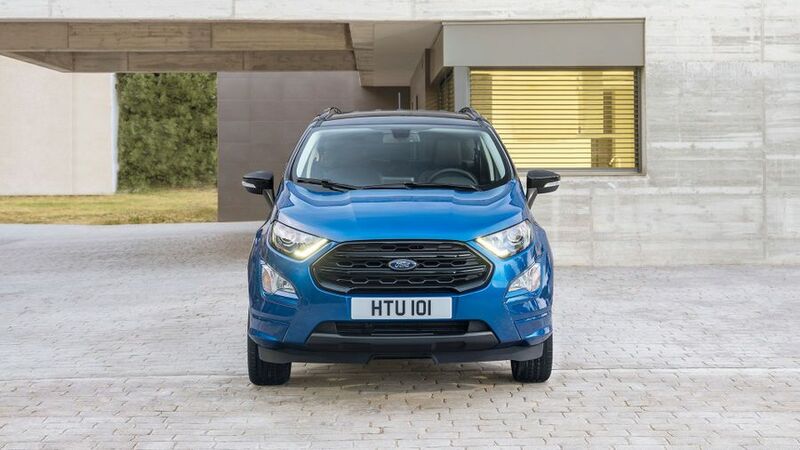 The front end of the latest Ecosport is dominated by a big, bold grille, and an X-section bumper, which Ford’s designers claim draws its inspiration from the straps on a backpack. This is accentuated by angular headlights that incorporate LED daytime running lights, and a bonnet with a pair of bulges to give the Ecosport a contemporary look. At the same time, the rear bumper and tail lights have been revised, while buyers can choose from a wide range of exterior colours, and can further personalise their car by choosing a contrasting colour for the roof. 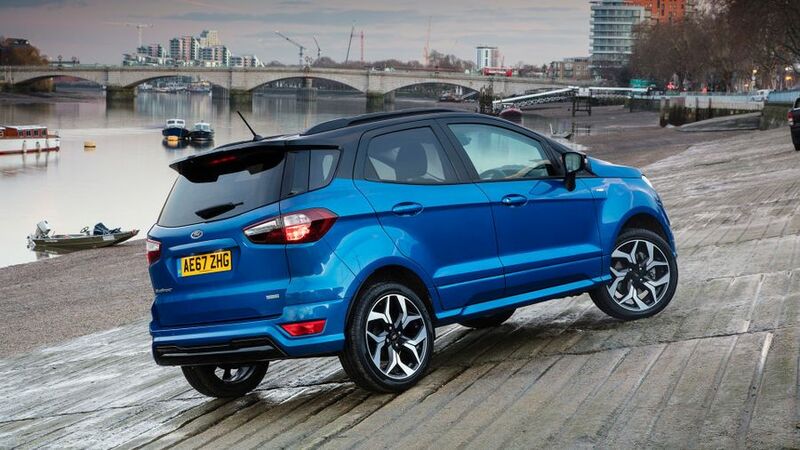 Ford has taken steps to improve the Ecosport's cabin quality, as it was a real area of weakness in the last version. 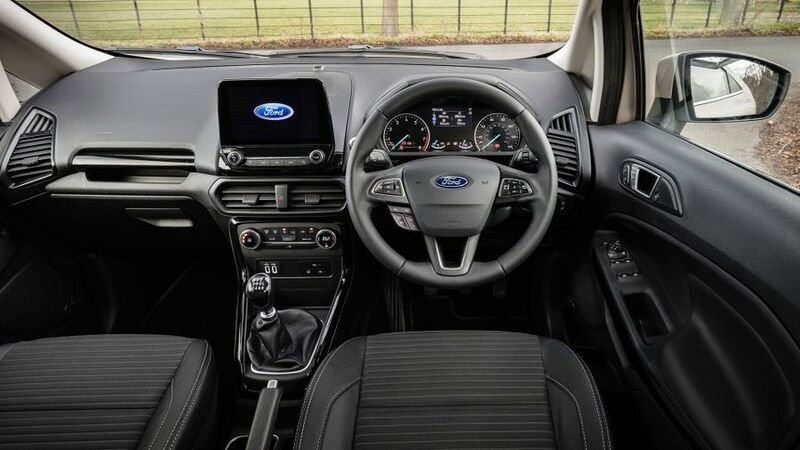 The cabin now looks fairly similar to that of the latest Fiesta supermini, with big, easy-to-use controls, and a reprofiled centre console featuring a floating touch-screen that displays all the infotainment menus. However, while the overall quality has is improved, there are still plenty of tough, abrasive plastics, and some of the panels don’t fit together with the same precision as those found in a Seat Arona. The Ecosport provides a commanding view of the road ahead, but the thick windscreen pillars create quite significant blind spots, which can make it difficult to spot other cars when pulling out of junctions or when trying to join roundabouts. The steering wheel does have a decent range of adjustment, but the area around the pedals might seem a bit cramped for some drivers. There’s a decent amount of space for four, along with the additional nicety of reclining rear seats. There’s also plenty of room under the front seats for those in the back to slide their feet underneath. 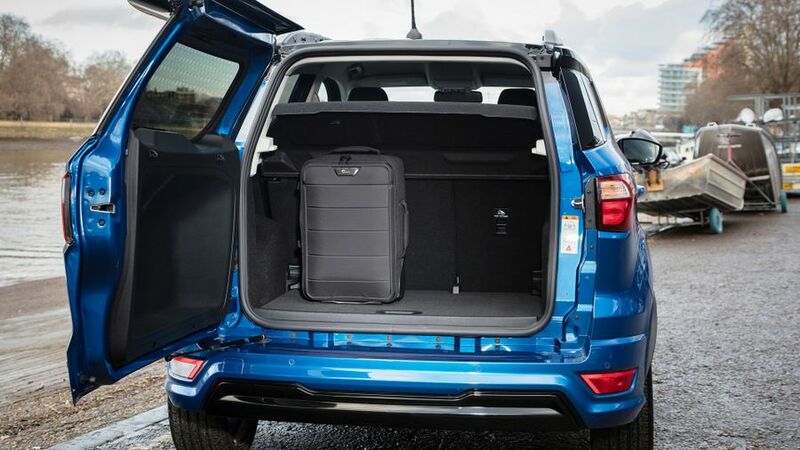 In even better news, Ford has moved the old Ecosport’s rear door-mounted spare wheel to the options list, as it blotted out even more of the already limited rear visibility, and added a lump of deadweight that made opening the side-hinged rear door a real struggle. Unfortunately, the rear door – which is designed for left-hand drive markets – remains a pain. Fundamentally, because the door swings open towards the pavement, if you’re parked on the correct side of the road, you have to stand close to passing traffic to open it. What’s more, unless you’re able to limbo, you’ll need to find a very generous parking spot to ensure you can walk around the open door when unloading your shopping. At just 356 litres, the boot is also on the small side compared with rivals, but at least the rear seat-backs split-fold and tumble up against the backs of the front seats to boost your load-carrying options. Alternatively, you can fold the seat backs onto their corresponding cushions and use the adjustable load board to fill in the large void in the boot floor. The Ecosport is a tall vehicle with a comparatively small footprint, and in order to prevent it from rolling around too much in corners, it has quite stiff suspension. That means the ride feels overly firm for too much of the time. You feel quite a lot of shudder when you’re just tootling up the high street, and when you go faster, bumps have an even more dramatic effect. What’s more, the stiff suspension doesn’t really help all that much with the handling anyway, because the Ecosport still feels decidedly top-heavy when you’re changing direction. 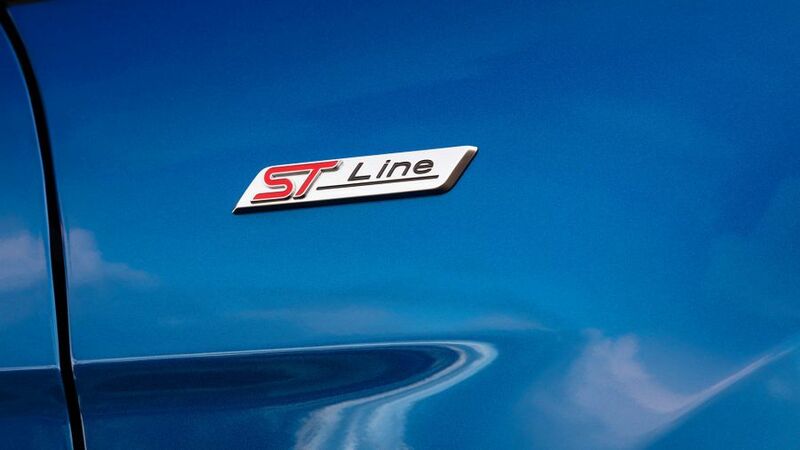 That’s also the case on ST-Line models, which have an even sportier suspension setup. We’ve driven three different versions of the Ecosport and all have displayed different levels of steering weight and feel. The overriding character common to all of them was a reasonable amount of feedback, albeit with an overly enthusiastic self-centring action. This means the steering can feel a bit too heavy when trying to hold the car steady in bends. You’ll also notice quite a bit of vibration through the steering wheel as the Ecosport’s suspension chunters over rougher surfaces, and quite a bit of tyre roar is evident at motorway speeds, but at least the weighty steering and firm suspension help the Ecosport feel secure and stable when you’re cruising. The 125 horsepower, 1.0-litre three-cylinder petrol engine is likely to be the best seller, and it’s easy to see why. It’s an incredibly flexible engine, pulling strongly from low revs, and it’s also willing to rev to dizzying heights. However, it’s not exactly the most cultured engine we’ve driven. Although it’s quiet at idle, it does generate some distinct vibration, which you’ll notice pulsing through the steering wheel, pedals and through the floor as the revs climb. This engine is also available with a six-speed automatic gearbox, but it’s not the finest example of the genre. It’s fairly slow to react to a dab of the accelerator, and it slurs slightly as it shifts between gears. What’s more, it also produces quite a pronounced shudder as it shifts down, so we’d stick with the sweet-shifting six-speed manual gearbox. We’ve also tried the stronger 140 horsepower version of the same engine, and unsurprisingly, it’s very similar in character. Thing is, you’ll have to be concentrating pretty hard to detect any advantage in performance, so we’d save the extra money it costs to buy and stick with the less powerful version. 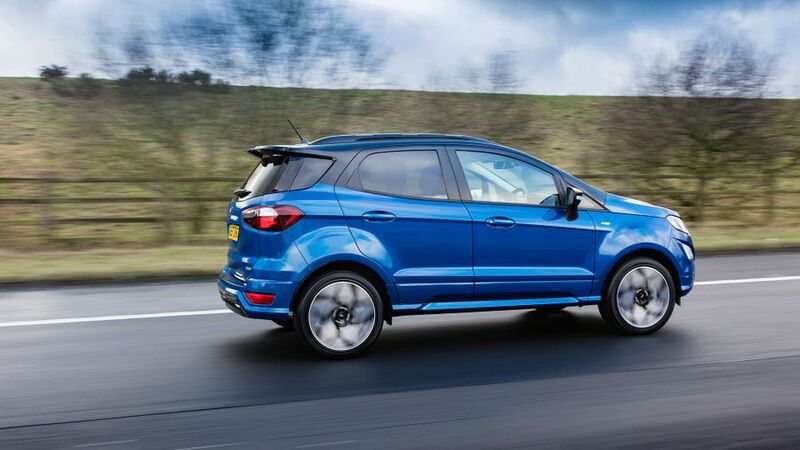 The Ecosport is also available with Ford’s latest 1.5-litre diesel engine. Although it’s not as cultured as it is when fitted to the Fiesta, emitting more of a hollow warble at lower revs, it’s still pretty refined and delivers strong power delivery at low and mid-range engine speeds. 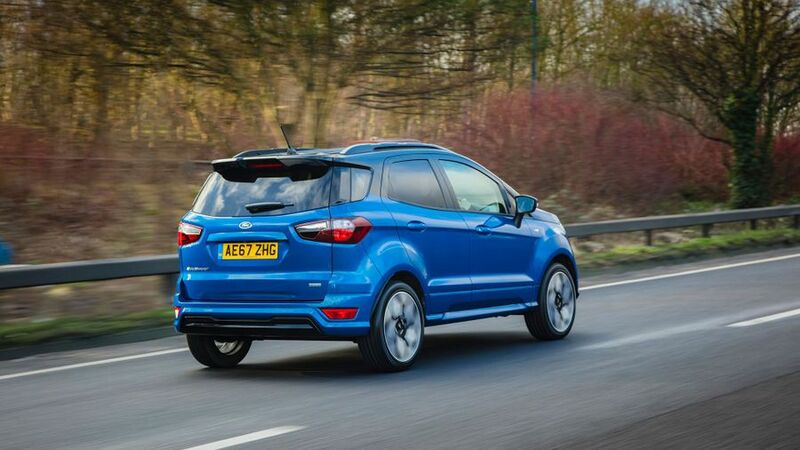 Consequently, it requires very few revs to get the Ecosport up to motorway cruising speed, and once it’s relaxed in top gear, you’ll struggle to tell it apart from a petrol engine. The good news is, the Ecosport is affordable to buy, and competitively priced compared with small SUV rivals. 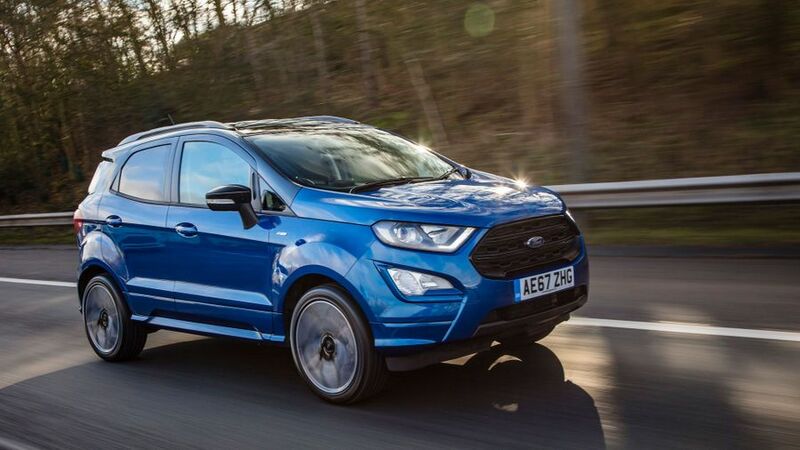 However, do bear in mind your overall long-term running costs will rely largely on depreciation, and the figures we’ve seen suggest the Ecosport to be adequate – if not amazing – on that score. While the diesel models will cover greater distances between fill-ups, most people will be better off buying one of the petrols. The 125 horsepower version would be our pick as it’s capable of decent fuel economy and will cost less to buy than the diesel. The Ecosport makes extensive use of proven technology. For instance, the engines and gearboxes are lifted from the well-established Fiesta supermini. We haven’t heard any horror stories from Fiesta buyers concerning common faults, and the car has performed well in customer satisfaction surveys and reliability studies. For example, Warranty Direct’s Reliability Index places the Fiesta (albeit the previous versions) near the top of the scale for dependability, all of which should bode well for Ecosport owners. The safety kit in the latest Ecosport includes driver and passenger front airbags, a driver’s knee airbag and a pair of curtain airbags. The standard roster also includes emergency assistance call out and MyKey, a system that allows several keys to operate the car, but with various settings (such as the car’s maximum speed, the volume of the stereo and so on), uniquely programmed to each key by the owner. There’s some optional safety kit available, too, including a blind spot information system. However, the really clever safety measures that are commonly available on such cars these days, most notably automatic emergency braking, aren’t included as standard and aren’t even available as an option. That’s a bit disappointing. The latest car hasn’t been tested by Euro NCAP, but from a safety point of view, it’s not all that much different to the previous version, which scored a four-star rating back in 2013. That was no great shakes back then, and the standards have become much tougher since. The Ecosport comes in three trim levels: Zetec, Titanium and ST Line. 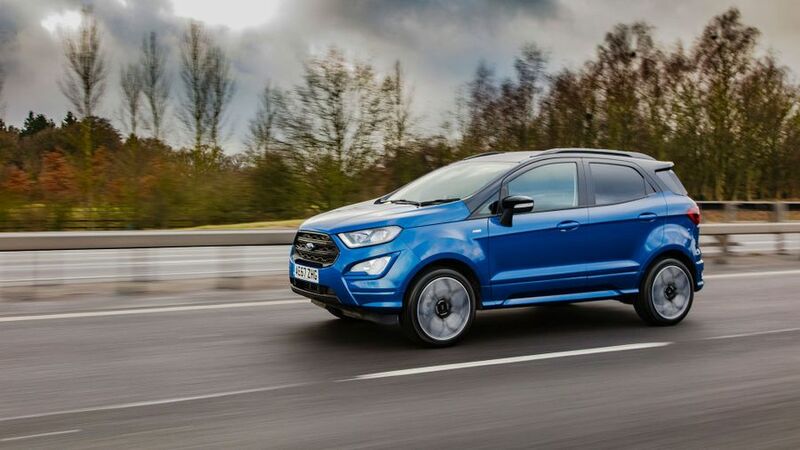 In our opinion, you should buy your Ecosport as cheaply as possible, as Zetec trim comes with most of the things you’ll need. These include alloy wheels, air-conditioning remote central locking, electrically-operated door mirrors and all-round electric windows. Also included is Ford’s SYNC 3 system, which comes with DAB radio, a 6.5-inch touch-screen, Apple CarPlay, Android Auto and USB connectivity. A leather-trimmed gearknob and handbrake, and Ford’s brilliant Quickclear heated windscreen with heated washer jets, are also standard. Upgrade to Titanium trim and you’ll get a rear-view camera and rear parking sensors, silver-finish roof rails, cruise control, automatic lights, rain-sensing wipers and sat-nav with an 8.0-inch touch-screen. Partial leather seats are also standard-fit. On top of its sports suspension, ST-Line adds plenty of visual upgrades including bespoke bumpers, side skirts and a rear roof spoiler, black-finish roof rails and contrasting coloured roof and door mirror housings. 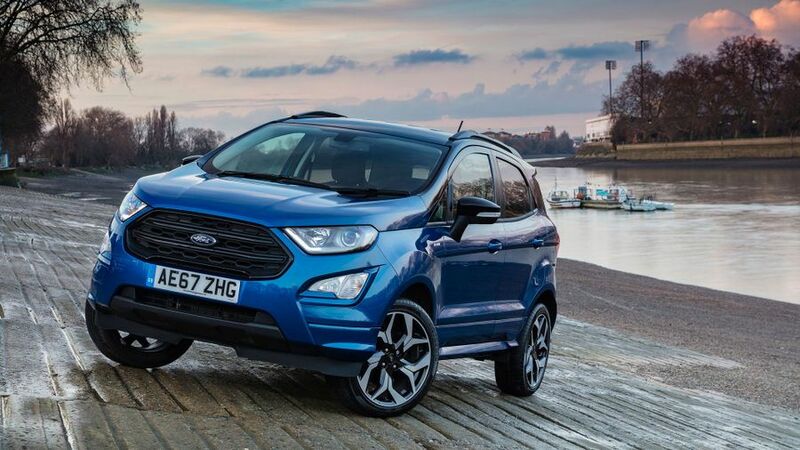 The latest Ecosport is a definite improvement over its predecessor, with improved interior quality and technology, and it also offers a marginally better driving experience. But, there are still plenty of superior alternatives in the ever-growing mini-SUV sector. 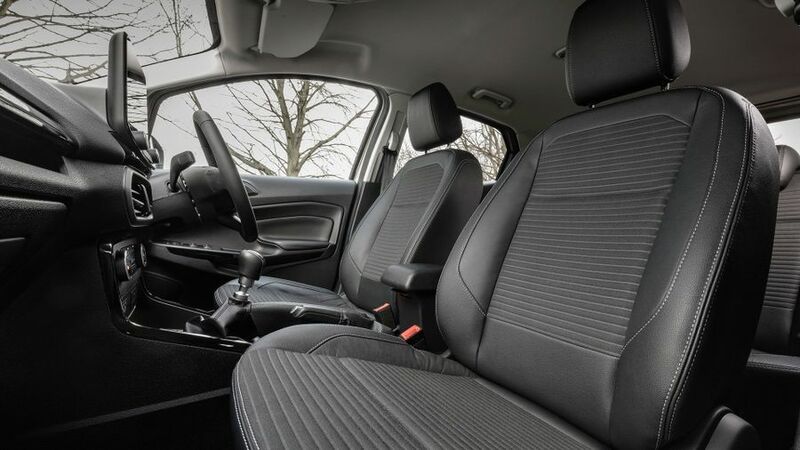 Both the Seat Arona and Renault Captur offer better quality, comfort and refinement.